Something besides money is being churned out of Lower Manhattan’s real estate boom. At 40 Rector Street, a block from the 64-story, 780-foot-high residential tower under construction at 50 West Street, are two roomy studios. There, next to the new building's high-tech sales office, artists are creating works inspired by the plans, people and structural innards of the nearby soaring tower. 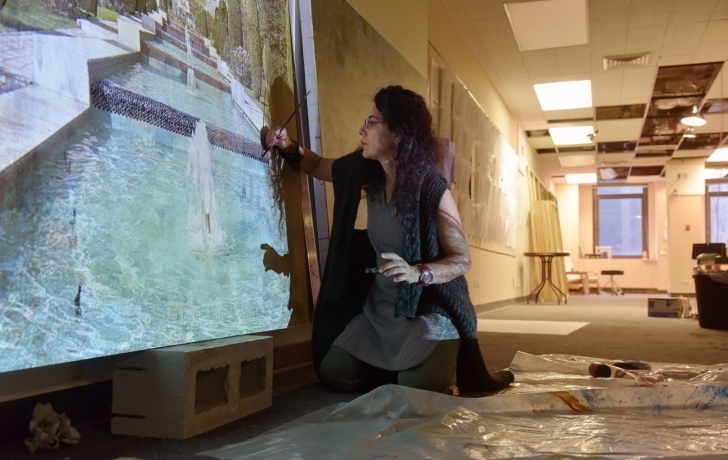 A native of Iran, Behbahani experiments with images inspired by the construction, by local history, or by the building’s architecture, which she layers over the picture of a Persian garden. It could be the electrical grid of the penthouse, parts of the building’s skeletal form, even the Half Moon, the boat that Henry Hudson sailed up the river. The space where she and three other artists have worked is provided free, along with a stipend, by Time Equities, Inc., the developer of 50 West. In exchange, the artists’ work will be hung in the new building. All the artists are alumni of OMI International Arts Center, the multi-discplinary residency program in the Hudson Valley founded by Francis Greenburger, a collector of contemporary art and the founder and chairman of Time Equities. The 50 West residency grows out of the company’s Art-in-Buildings program, in which art is rotated in the lobbies, atriums and other public spaces of Time Equities-owned properties. “The artists found the proximity to the site and the activity and the workmen to be very inspiring,” he said. For artist Hugo Bastidas, the inspiration came from both the men and the complexity of the site where they work. “Here’s one where the carpenters are working,” said Bastidas, pointing to one of many large monochrome paintings resting on the studio floor. It is a view looking down at the tiny figures of men nearly lost among the massive backdrop of rebar and concrete. Next to it lay the portraits of workers, also in black and white, their facial features fully rendered, their bodies reduced to sketch-like simplicity. Unlike Bastidas’s richly detailed, monochromatic works, Noa Charuvi’s paintings are colorful and semi-abstract, featuring the mundane stuff of construction sites—electrical risers, orange cones, saw horses, two-by-fours—that would escape most people’s notice, artists or otherwise. Going into her residency with the thought that it would be a brief “side project,” Charuvi became so enamored of the the site that she now continues to paint from photographs she took there, months after her residency ended. Paul Anthony Smith said his large output of work during a nine-month residency, including enough pieces to fill a solo show in Chelsea, was partly aided by the space.